The following terms and conditions explain what you should expect when buying and owning our products. These are tables with oak tops up to 65mm thick, made from single pieces of kiln-dried oak. These include the Komodo, Iguana, Scorpion and Piranha tables and benches. 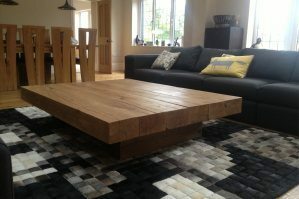 These are tables made entirely of oak beams approximately 125mm / 5” thick, which have been partially dried. These include the Arabica, Amazonica, Mantis, Chameleon and Pedestal tables. These are made by Hussl and the terms and conditions can be seen by clicking here. 1 – To confirm a table order we take 100% payment of the order total, including delivery and VAT. For your peace of mind, all standard table designs come with a 14 day money-back guarantee. 1a – In accordance with The Consumer Contracts (Information, Cancellation and Additional Charges) Regulations 2013, you are entitled to cancel any order within 14 days starting the day after receiving all of your products. If a product is bespoke, i.e. not a standard option listed in our price list brochure, the cancellation rights are not applicable. 2 – Typical lead time is 8 weeks maximum, however we always aim to minimise this duration. Please ask if you have specific needs. The table tops are made from single pieces of solid oak. Cracking is not common but it should be expected as the oak breathes naturally and therefore expands and contracts slightly throughout the year. Over time, the oak will also shrink slightly (up to 5%) across the grain, or width, of the table. New tables may have thin cracks in the ends of the oak pieces. We select our oak for its natural beauty, so you should expect knots and other natural features of the wood to be visible. These will be left in their natural state unless specifically asked to do otherwise by the table owner at the time of order. The width of oak planks in any table top may vary, but all pieces will be a minimum of 150mm wide. Because our live-edge tables have a 100% natural edge, we’re unable to offer “more” or “less” degrees of live-edge. For anyone who doesn’t want a 100% live-edge, we offer a square-edge table top option. Because the live-edge of a table undulates, the finished table width in a live edge table top may be +/-5% of the specified width at the time of order. Because of the seasonal movement in the oak planks, due to their natural breathing throughout the year, gaps may develop between the planks. The table structure is designed so the planks can be loosened by the owner and pushed back together. This may eliminate the gaps, or simply reduce them, but the table will maintain 100% of its strength and integrity. Because we use 100% natural oak, differences in the colour of the planks are to be expected. All glass supplied with our tables is 10mm toughened to European safety standard to prevent shattering. This means it is able to support any reasonable amount of weight from common indoor living room items, but extra care should be taken when removing or moving the glass as the edges can chip. If you chip a piece of glass we would be happy to provide a price for a replacement. Our tables are designed so that if any part of the table is damaged it can be removed and repaired, or if necessary replaced. We can provide a quote for any repair damage on request. The stainless steel bases come in a brushed finish as standard. This finish can be damaged with impact from another object, but can be restored by hand using the correct brushing pads. Please contact us for any recommendations on how to do this. The stainless steel used to make our table bases is 304 grade. That means it is resistant to corrosion if kept clean and moisture-free. A stainless steel cleaning product should be used on a regular (monthly) basis to maintain their condition and they should always (daily) be checked and kept dry. Our powder coated (painted) table bases can be chipped with impact from another object. Any damage should be repaired (touched-up) by a professional to avoid corrosion of the parent steel. Our oak-base tables are susceptible (as all oak is) to seasonal movement and slight shrinkage over time. The design allows this to happen, but the table top planks may need occasional adjustment (loosening-repositioning-tightening) to maintain the table’s appearance. 1 – As we use 100% natural oak beams, the appearance of each table will be unique. 1a- Colour Finish – The images across the site are intended to give an indication of the variation in the finished appearance of the tables, however due to the unique nature of light levels we are unable to colour-match based on photographs. If you require a specific colour or finish then please provide the product and application that you would like us to use on your table. 1b – Natural Features – Every beam is unique and will have its own unique features. As a result, we cannot guarantee what natural features will appear in the beams of any table. Based on the photos on the website, you can expect any or all the following features in your table: splits and cracks, natural colour variations (from white / cream to dark brown), knots (left unfilled or filled depending on structural needs to solidify the area), curves or chamfers along beam edges, undulations in the beam surface and edges, areas of varying texture and depressions or gouges in beam surfaces. 2 – As the oak beams are partially dried before the tables are made, it is likely that cracks, knots and natural features will be present in the table when new. This is to be expected with any oak beam table over 3″ thick. Our oak beam tables are approximtely 5″ thick (125mm). There may also be markings from how these huge beams are stored and handled by forest machinery, which we will use our best judgement to finish to the best possible standard without artificially altering the natural appearance of an oak piece. 3 – You have 14 days from receiving your table to inform us of your with to return it, if you are not satisfied that the table(s) you have received meets the expectations described on this website including these terms and conditions. We will arrange collection of the table on the next available delivery to your area. Any rectification / modification work will be discussed on a case-by-case basis. If no agreement can be made to modify the table to your requirements, the full balance will be refunded within 14 days after collection of the table. If any work is required to return the table to new condition, the cost of this will be deducted from the refund amount. 4 – You should care for your table by dusting (or soft-brush vacuuming) once every 1-2 weeks. You can wipe the surfaces clean with a damp cloth, then immediately drying the surface. 5. The table is finished in a stain-resistant coating but it is not stain-proof. Coasters should always be used under cups and place-mats used under plates to protect the table surface from scratching, moisture and heat. If anything is spilled on the table it should be dried immediately, then wiped clean with a damp cloth and dried again to remove any residual moisture. If the table stains it can always be repaired, either by you for light stains or by a professional. Please contact us at info@tarzantables.co.uk for instructions. For re-coating of the protective finish, for highly used tables like coffee and kitchen tables we advise applying another coat of finish after the first 6 months, then every 12 months after that to maintain the level of protection. For lower-traffic tables like TV and occasional dining tables, we recommend applying a new coat of finish every 12 months. Our tables are finished with Blanchon Hard Waxoil. 6. As the oak beams dry out in the warm dry home environment, there will be movement in the beams which mostly takes place in the first 12 – 18 months. Some minor movement may take place after this due to the seasonal change in humidity in the home. As the oak loses moisture it shrinks across the grain, causing cracks to appear and / or widen and the beams to twist. Our tables are designed specifically to allow this movement to take place without any unnatural constrain of the beams, so whatever state the beams are in is their natural dry resting state, so they will always look natural and maintain the maximum level of their natural strength. The table top beams are fitted with adjustable supports so that if a beam develops a wobble, its supports can be adjusted manually to correct the wobble. If any cracks open up and a sharp edge becomes a concern, we can supply a small kit for you to quickly sand the edge smooth by hand and re-coat the area with the same finish used on the table. Just contact us at info@tarzantables.co.uk to request a kit. TFL cannot be held responsible for any cuts, splinters or scrapes as a result of sharp edges not being smoothed out. 7. 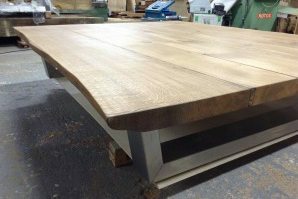 The Nature of oak beams is that they are likely to move as they age, its impossible to predict the degree to which this will occur and when you purchase an oak beam table you are accepting that the table may change shape. If you decide that restoration work is required on the table for any reason, we will be happy to provide a quote for this work. Please Note: Table refurbishment may reduce the width, thickness and height of the table by up to 10%. 8. 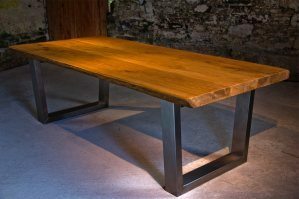 Because of the weight of the beams and the nature of the drying oak, our tables are help together under their own weight using a series of grooves, rails and feet. This allows them to be taken apart very quickly to be moved around. Please take extra care when lifting the beams, we advise that 2 people should always be used to lift any beam with normal best-lifting practices (bent legs and straight back). TFL can not be responsible for any injuries or personal or property damage caused when lifting, moving or dropping any table or beam. Smaller tables (up to 3 beams, up to 1m long) may be slid along the floor by 2 people, but should always be pushed by the base pieces simultaneously, never pushed by the top of the table. We would always advise taking the table apart to move it rather than sliding it. If you would like any advice before moving a table or re-assembling, please contact us at info@tarzanfurniture.co.uk. 9. All glass supplied with our tables is 10mm toughened to European safety standard to prevent shattering. This means it is able to support any reasonable amount of weight from common indoor living room items, but extra care should be taken when removing or moving the glass as the edges can chip. If you chip a piece of glass we would be happy to provide a price for a replacement. By purchasing a table from this website you accept these terms and conditions of the sale agreement. If you would like any further info about any of these terms and conditions before purchasing please contact us at info@tarzantables.co.uk.